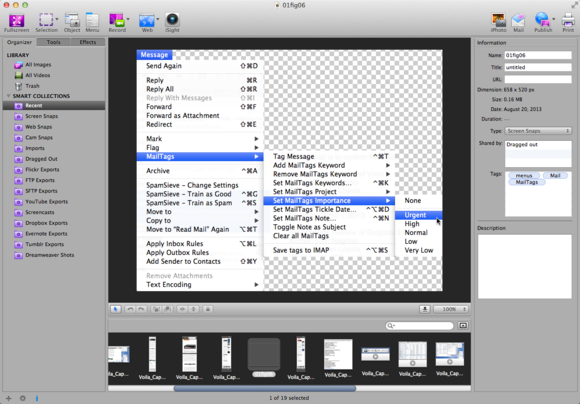 Some screen capture utilities focus on capture tools, leaving annotation and touch up for other programs. Others include their own image editing tools, providing the convenience of image capture and finishing in a single program. Global Delight’s Voila takes the latter, all-in-one approach, with considerable success. It also has strong organizational features, so if you take a lot of screenshots, Voila should be at the top of your list. Voila captures screenshots or full-motion video, and has a very wide variety of screenshot capture modes. Some are standard, such as fullscreen, rectangular region, object (a window, for example), or menu. You can also capture polygonal, circular, or freehand regions, which I think are of dubious value. You can snap pictures with your iSight camera or other webcam. Most captures can be taken immediately, or with a timed delay. Add Your Annotations: You can touch up your screenshots by cropping them and adding changes visible and unnoticeable. I added the big OK stamp, and also eliminated a banner ad in the site’s header. I found Voila’s region and object captures—the kind I do the most—to be somewhat less convenient than the similar All-in-One capture type in TextSmith’s Snagit ( ). Voila lacks a magnification window near the cursor that allows you to select region edges with more precision; and Snagit’s object selector can find and snap to objects within windows, making it easy to shoot a toolbar or other user interface object. Surprisingly, Voila’s automatic naming for screenshots is rudimentary. All you can do is add a prefix and the program automatically adds a sequence number. I’d like to see the ability to timestamp shots and use more flexible naming conventions. Voila lets you choose from two methods of acquiring shots from the Web (besides simply capturing a selection from your browser). You can grab a picture of a whole Web page from your default browser, with automatic scrolling. Or you can open any URL in Voila’s built-in browser. This then allows you to capture any rectangular portion of the page (with scrolling, if needed), or one or more of the DOM elements from the page. For example, you can grab the DIV containing a navigation bar, or just the page footer. For page designers, this is a killer feature. Web capture even grabs the page’s metadata keywords to add tags to the screenshot for use with Voila’s organization features (more on those in a moment). Video recording captures either the entire screen or a selected rectangular region. Unlike some other programs, Voila can record stereo audio and gives you a choice of frame rates. You can do simple trimming of videos in the editor, but it’s not a full-featured editor like Screenflow ( ) or Camtasia. 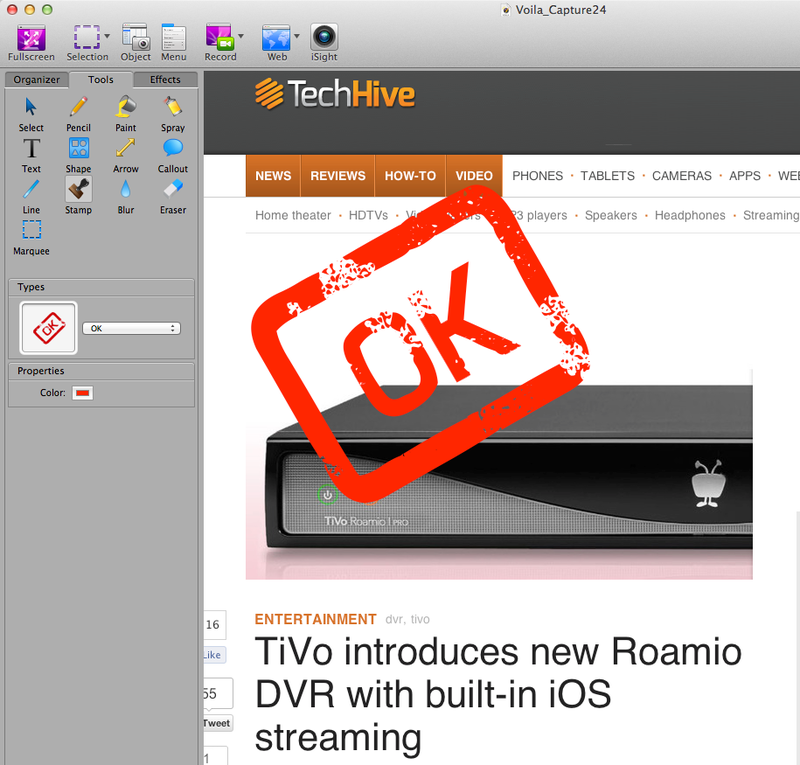 All of Voila’s capture methods are available from the application, from a systemwide menubar extra, or using hotkeys. After capturing your image or video, it is sent to the Voila Editor, which has a large selection of vector drawing and effects tools to edit and annotate your images. You’ll find the expected drawing, text, arrow, and callout tools, as well as special effects to add the appearance of torn edges to shots, color filters and adjustment, and region highlighting. Selecting an image in the scrolling library area at the bottom of the window brings it to the editing pane. Each image annotation is kept on its own layer, and you can move layers forward and backward. The Editor works well for the most part, but I found a bug with the paint tool that kept transparent areas from being correctly filled. The company acknowledged the problem, provided a workaround, and says it is working on a fix. I also ran into a handful of other cosmetic bugs, indicating to me that the program needs a bit more quality assurance polishing. One small drawback to the Editor is that you must use it; you can’t save shots directly to disk. I’d like the option to skip the Editor and have the Save As dialog appear immediately after capture. You can add and edit a capture’s metadata in the Information pane to the right of the editing window. Besides useful information such as dimensions and file size, you can categorize the capture and add custom tags and a description, to help keep screenshots organized. Organize and Edit: After you take a shot like this menu (with its nice transparent background), it ends up in the Voila Editor, which flanks the shot to the left with the Organizer tab and the Information pane on the right, with the current Collection scrolling beneath the screenshot. You can rename and tag the shot in the Information pane. The Voila Editor provides a unique and very useful Organizer tab that I haven’t seen in competing programs. The Organizer allows you to group your captures into manual and Smart Collections. The program comes with many premade Smart Collections for different kinds of captures and capture destinations. You can create your own Smart Collections, grouping together custom tags you apply to screenshots. This is great for projects that might require you to keep many screenshots in different folders; with Smart Collections and tags, you can still easily review all the screenshots in the project for consistency. You can share any capture in the editor by dragging and dropping it to the Desktop or other destination, and you can choose the default sharing file format. You can export captures to iPhoto, email, and many online destinations, including FTP/SFTP, Flickr, YouTube, Dropbox, Evernote, and Tumblr, but notably excluding Twitter and Facebook. Voila is available from the Mac App Store or the Global Delight website for $30. This is $20 less than Snagit, though the Snagit Mac price includes a license to its Windows version, a significant benefit if you have cross-platform needs. But if all you care about is Mac screenshots, Voila is a good value. Once it is a little more polished, eliminating its niggling bugs, it will be an excellent value. Good capture features and excellent screenshot organization merits your consideration.